But this year, Romo has decided to dial his golf schedule back in the offseason. This most noticeably includes his decision to skip out on 2013 U.S. Open qualifying, as well as trying to qualify for the HP Byron Nelson Championship which was held last week on the PGA Tour. Romo has made it a habit to try and participate in both. Not only that, Romo opted out of the Azalea Invitational in Charleston, South Carolina, which is one of the coveted Amateur golf events in the United States. Romo has cited his wanting to work harder in the offseason at his main job. You know, that one where he throws the ball around the field. That should make for the Cowboys fans to be happier with their quarterback, considering his lack of playoff berths and championships that he been partially responsible for. It’s hard to blame Romo entirely, because the guy does put up numbers. And lord knows the Cowboys have more than just one problem. But Romo choosing not to play as much golf this season might have a little something to do with the fact that he was just given a new six-year deal worth $108 million. That’s 108 million reasons to work a bit harder on the football field, and spend less time away from the golf course, despite the fact that he clearly enjoys playing both games. 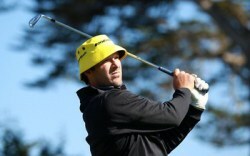 While we still expect Romo to put some time in on the golf course throughout the year, we might have seen the last of the days where he tries to qualify for the U.S. Open, at least, as long as he is the quarterback for the Cowboys. After he hangs it up in the NFL, and he is healthy, we can assume that he will on the links going for some more tournaments.